In 1813 the rank of Colour Sergeant was instituted. 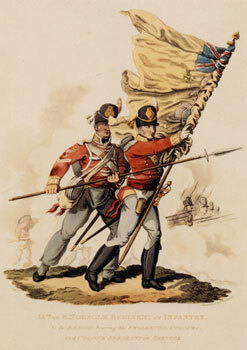 The same year this drawing was made showing a Colour Sergeant of the 9th Foot protecting the Regimental Colour and the junior officer carrying it. There is a life-size model in the centre of the museum based on this print. Drawn by C Hamilton-Smith, Quartermaster General, 1813.